The NanoSIMS is used here to contribute to the understanding of the segregation and diffusion of elements in polycrystalline materials. The strategy is to make use of 18O stable isotope tracers in order to image and quantify the incorporation of oxygen. A sintered transparent YAG (yttrium aluminum garnet) is oxidized in a 18O2 atmosphere at 1400°C. The 18O oxygen atoms diffuse inside the ceramics through the grain boundaries as evidenced from the two complementary images (gray-scale image on the left), of 16O (base element of the oxide) and 18O (incorporated during the oxidation sequence). 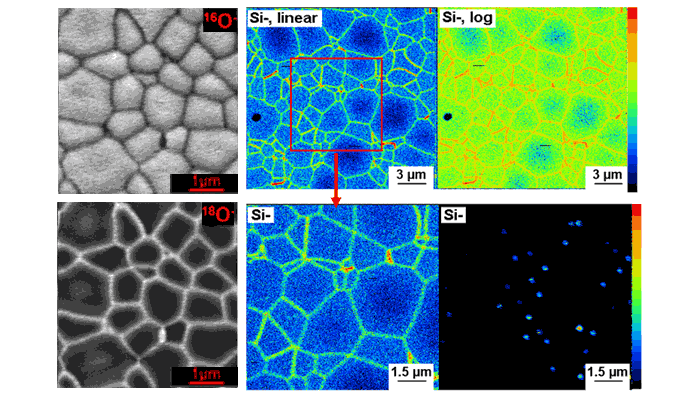 The full color images show the segregation of silicon dopant toward grain boundaries in YAG samples after sintering. In the upper row (middle and right images), the same silicon image is displayed in linear and logarithmic color scale, revealing the high sensitivity and dynamic range of NanoSIMS dopant imaging. Lower row, middle image is zoomed from the upper row middle image. Lower row, right side image displays another type of YAG sample showing dopant segregating to triple points. Data by courtesy of Dr. Hajime Haneda, NIMS, Tsukuba, Japan.